Last week Noah came with me to my gestational diabetes education class. He was the only dad to come along, and I was all, "Yeah, he's awesome." I was most worried about the finger pricking, but it really wasn't that bad at all. My friends Tim and Jessica very sweetly sent me lots of info via Facebook (Tim's Type 1, Jessica had g.d.), which helped me pluck up the courage for the four-times-daily glucose self test. 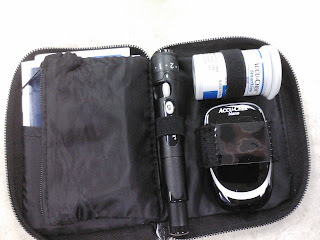 I'll admit I got a little flustered when the diabetes educator kept using the word "lancets" in relationship to something I was going to have to poke myself with. 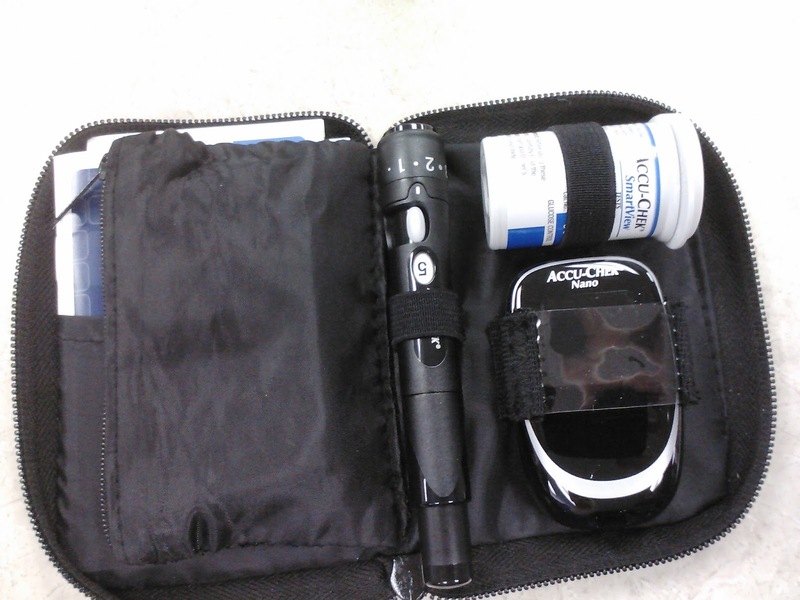 (The lancets are in that little pen/flashlight looking thing.) But she had us set the depth on a very manageable 1.5, which is no worse than a near-miss with a splinter. Here's the thing, though: the depth range goes from .5 all the way to 6.5, and I have absolutely no idea why one would ever use a 6.5 setting. At-home bone marrow sample? Braining a zombie attacker? Display of Sioux bravery through personal pain infliction? I've been doing this four times a day for a week, and although Noah very empathetically (and perhaps foolishly) told me he'd do the test too, for solidarity, it was only tonight that he finally sat down with the lancets and went for it. Well, maybe "went for it" is too strong a phrase for what actually happened. It took three clicks before he pressed it tightly enough against his finger for a lancet to actually break the epidermal surface, on a 1 setting. Then, when the tiniest pinprick of a droplet began to rise to the surface, the whole thing came apart and he collapsed back onto the chair, hyperventilating. He didn't let me squeeze his fingertip so that enough could come out to even run the test—and the required drop is so minuscule, you could probably extract the requisite sample from a dry-nosed booger and still do the trick. "When I saw the blood gushing out, I just..." he breathed shallowly. "I just feel weak, like in my muscles." "Are you okay?" I asked with as much sympathy as I could muster. If my sympathy were a lancet setting, let's just say we wouldn't be doing anyone an injury. "Maybe I shouldn't have used my fret hand," Noah reasoned. "Was I supposed to wash my hands? I've probably got a staph infection." Ethan, of course, was extremely concerned. "He's already fainted," he said at one point, lifting one of Noah's limp arms before adding, "Your bones look okay." So that's a relief. Several minutes passed, Ethan fussing over his Daddy like Madam Pomfrey over Harry Potter after one of his close encounters with Voldemort. "Maybe I could try again now," said Noah bravely, if weakly. "No, don't!" Ethan shrieked. So Noah, showing solidarity with Ethan, has yet to attempt a second brush with death via diabetes lancet. "If my sympathy were a lancet setting..." LOLOL - that's hilarious. Although I'm with Noah about the sticking myself with things - ouch!